They didn’t mean to, but they’re wrong. Let us explain why your RWD sports-coupe is going to serve you perfectly fine in the winter, despite what other people may say. You’ve just left high school, and are now in that strange period of life in which for some reason, you’re being called an adult despite the nagging feeling that you’re still twelve-years-old. Naturally, when it comes time to buy your first car, your inner twelve year-old mocks more pedestrian choices, opting for something wild and irresponsible. While your parents envision a beige 10 year old Toyota on the driveway, you envision a fire-breathing V8 powered, RWD, middle-finger to the world. Now, in 2016 the former point is simply common sense. Whether it be AWD, FWD or the dreaded RWD, if you try to make it through snow on all season tires, you’re asking for trouble. The economy all-season rubber that came on your Subaru Impreza was designed to produce low rolling resistance for better fuel economy, reasonable grip in wet and dry conditions, and acceptable ride quality. It wasn’t designed to march through six inches of snow with authority. On that note, anything from a V8 Mustang to a Subaru WRX STI is going to have trouble in the winter without the right tires. You’re leaving work groggy eyed and sleep deprived, and there’s a fluffy inch of snow on the ground. You turnout of the driveway in your Scion FRS, give it a bit too much gas and the rear of the car swings outwards. You, the adept driving enthusiast, barely flinch as you counter-steer and gently add enough throttle to ease the car out of what appeared to be a deliberate, graceful drift. Your coworker Billy however, couldn’t care less about driving, and he follows you in his 2003 Crown Vic borrowed from his ex-cop father-in-law. He sees your “jap-crap” sports car sliding around, and attempts to assert his dominance by putting all 272ft-lbs of American torque down to the ground. The rear of the Crown Vic steps out of line, Billy panics and slams on the brakes, and before you even notice his headlights in your rearview, he’s spun around and landed in a ditch on the opposite side of the road. Billy then grows up, to tell his kids about how horrible RWD cars are in the winter. Spinning the rear wheels and sliding around a corner is no more dangerous than spinning the front tires and understeering into the opposite lane. That’s not to say that RWD cars don’t understeer in the winter; they certainly do. However I highlight a RWD car’s tendency for power-on oversteer because most people consider understeer to be manageable. On the contrary, too many people confuse oversteer with losing control of your car. Winter driving a RWD car is not a death-defying task, but you need to understand how to catch oversteer through counter-steering, and you need to have good throttle control. Manage these two things, and you’ll be fine. My point is this: because the drivetrain of a RWD car puts the differential, most of the transmission, and often times much of the engine behind the front axle, they tend to be more rear-weight biased than FWD cars. Due to their drivetrain layout, they also tend to be heavier to start with than FWD. The result is that both FWD and RWD put roughly about the same amount of weight over their drive wheels. 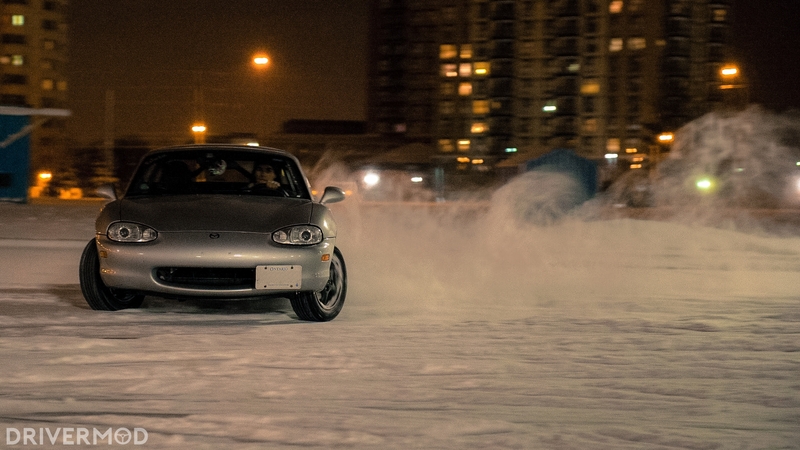 That being said, my 99′ Miata puts down less weight over its drive wheels than any car mentioned above, and I’m yet to have an iota of trouble in the snow. Once again – throttle control. Yeah, well good luck getting through that with your FWD Corolla. My point is not that RWD is the superior winter drivetrain – it doesn’t take a rocket scientist to know that an AWD car spinning all four wheels is better than just a RWD spinning just two in the snow. Likewise, FWD allows drivers to point power in the direction they want to go, which can be useful for trudging through deep snow. However, as a driving enthusiast, RWD and its associated power-on oversteer is seriously fun. Then, when the morning comes and you need to commute through several inches of snow, your RWD car will be utterly, completely fine. Just buy the right tires. Did I mention that you should buy winter tires? Buy winter tires. If you’re shopping for a RWD car, I beg you, do not let this notion that RWD is horrible in the winter deter you. It isn’t. DO purchase a set of winter tires. DO slow down and use caution when driving on snowy roads. DON’T put your hazards on and crawl along at 2 km/h in white-knuckled terror. It’s snow; fluffy, white frozen moisture that you can ball up and throw at people. Driving is still driving, just with a little more caution. DO take the time to learn counter-steering and throttle control when winter driving a RWD car. DON’T ignore the previous suggestion and proclaim to the world how horrible RWD cars are in the winter just because you refuse to learn how to drive them.